Editor’s note: The Academy will not publish This Week next week. The next issue will be published on Friday, Jan. 5. 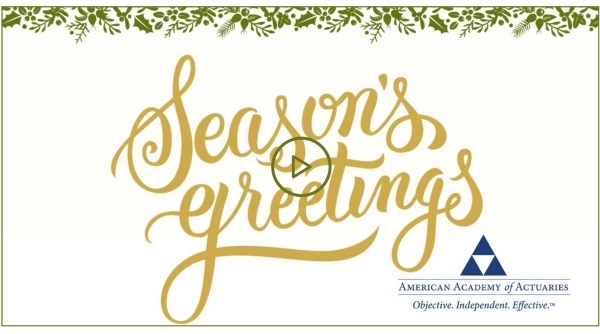 Happy holidays from the Academy. Wednesday’s professionalism webinar looked at case studies and examples of professionalism issues that have come before the Actuarial Board for Counseling and Discipline (ABCD). “Tales From The Dark Side: Ethical Cases at the ABCD” featured ABCD members Godfrey Perrott and David Driscoll, who drew upon staples of popular culture to provide entertaining and enlightening examples of such issues. More than 2,300 people attended the webinar, which was moderated by Academy General Counsel and Director of Professionalism Paul Kollmer-Dorsey. “The takeaway that we want to leave you with is the necessity of maintaining your reputation as a professional at all times, and upholding the dignity of the profession,” Driscoll said, citing investor Warren Buffett’s adage that it takes 20 years to build a reputation, and 5 minutes to ruin it. Slides and audio are available free of charge to Academy members. Academy dues are due on Jan. 1 of each year. The Academy has no record of having received your 2018 membership dues. Dues of $635 (for regular members) will assure that the Academy’s financial position remains strong as we continue to provide objective, nonpartisan actuarial analysis to U.S. policymakers. Highlights of the Academy’s mission-critical work this year are noted in the annual “The Meaning of Your Membership” report. Please log in to pay and make changes to your account before paying your dues. (Some members may qualify for a partial or full dues waiver.) If you have questions, please contact the Academy’s Membership Department at 202-223-8196, or membership@actuary.org. The North Carolina Department of Health and Human Services has a public employment opportunity for a program analyst / actuary. The purpose of this position is to provide highly technical financial management services in support of pricing, rate setting, financial monitoring and budgeting, forecasting, data validation and analytics, clinical policy analysis, and planning. The deadline to apply is Friday, Dec. 29, at 5 p.m. EST; a complete position description is available at the department’s website. The Committee on Property and Liability Financial Reporting released its annual Statements of Actuarial Opinion on P/C Loss Reserves practice note, which is intended to provide information to actuaries on current or emerging practices in which their peers are engaged related to signing NAIC P/C statements of actuarial opinion and actuarial opinion summaries. The Academy will host a webinar in January highlighting key life practice issues from the NAIC Fall 2017 National Meeting held earlier this month in Honolulu. The webinar will be held on Wednesday, Jan. 10, from noon to 1:30 p.m. EST. Register today. The Academy also will host a webinar on property/casualty issues from the NAIC meeting; that date and time will be announced soon. The 2017 Property/Casualty Loss Reserve Law Manual is now available for download. The manual is updated annually in multiple formats and is designed to help appointed actuaries know the NAIC Annual Statement requirements for statements of actuarial opinion. Order today. Be one of the first to have the 2018 Life and Health Valuation Law Manual. Available for delivery in January, the manual is designed to help appointed actuaries know the requirements of the NAIC model Standard Valuation Law and the Model Actuarial Opinion and Memorandum Regulation. The manual is available in online and CD-ROM versions, allowing you to order the format that best meets your needs. Order today. The Winter PBA Perspectives covers principle-based reserving (PBR) activity from the NAIC’s Fall 2017 National Meeting, including the NAIC’s PBR Implementation Task Force agreeing to disband, along with the PBR Review Working Group and the PBR Review Procedures Subgroup, and the NAIC’s Life Actuarial Task Force and Financial Condition Committee taking on new tasks related to PBR. Also covered are Academy Life Practice Council updates at the NAIC meeting, and ongoing state progress on PBR implementation. The Financial Reporting Committee submitted comments to the Financial Accounting Standards Board (FASB) on FASB’s proposed updates to market risk benefits in the accounting for long-duration contracts, and comments on FASB’s proposed updates to the accounting for long-duration contracts. Major tax-reform legislation was finalized Wednesday after the U.S. House of Representatives passed H.R. 1, following passage of a similar measure by the Senate. The Tax Cuts and Jobs Act was the result of a conference to resolve differences between tax reform bills previously passed by the two chambers. President Trump signed the bill into law on Friday. Congress extended the National Flood Insurance Program (NFIP) for four weeks, through Jan. 19. With the NFIP’s statutory authority scheduled to expire today, an extension was included in legislation to fund the federal government through a short-term continuing resolution. The president signed the measure into law on Friday. The Pension Benefit Guaranty Corporation (PBGC) announced through a final rule that it is expanding its Missing Participants Program to cover terminated 401(k) and other retirement plans. The PBGC’s expansion will be voluntary and available for defined contribution and small professional services plans that terminate on or after Jan. 1, 2018. The deadline for discounted early registration to the 2018 Enrolled Actuaries Meeting is Dec. 31. The EA Meeting, co-sponsored by the Academy and the Conference of Consulting Actuaries, will be held April 8–11 in Washington, D.C. Register today. A CBS News story on the Tax Cuts and Jobs Act—the tax reform bill that was signed into law by President Trump on Friday—cited the Academy’s warnings about the implications of removing penalties associated with the individual mandate from the Affordable Care Act (ACA). The story was reprinted by MSN and WBTW News13. More than 100 media outlets—including CNN Money, Los Angeles Times, HealthPayer Intelligence, Washington Examiner, Baltimore Sun, and InsuranceNewsNet—reported on the Health Practice Council’s (HPC) Dec. 12 letter to the U.S. House and Senate providing comments on the potential consequences of eliminating the ACA’s individual mandate. The Center on Budget and Policy Priorities issued a press release also citing the letter. Health Exec cited the HPC’s Nov. 21 letter to the Senate providing similar comments. Comments by Senior Health Fellow Cori Uccello, also on the on the potential consequences of eliminating the individual mandate, were cited in a HealthDay story that was reprinted by numerous media outlets, including the Philadelphia Inquirer, MedicineNet, Doctors Lounge, HealingWell.com, Health On the Net Foundation, and Health.com. A Healthcare Dive story cited the Individual and Small Group Markets Committee’s issue brief on association health plans. The Des Moines Register referenced the Academy’s issue brief, The 80% Pension Funding Standard Myth, in a story about Iowa’s Public Employees’ Retirement System. The story was reprinted by Press-Citizen (Iowa).